Come join our intimate and super - friendly group of Gay Daddies, admirers and friends aboard the Viking Longship Ingvi for a special holiday Danube River Cruise. 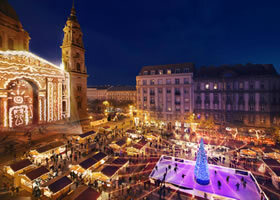 Sailing in early December means we get to visit two of the most renowned Christmas markets in Europe - Vienna and Budapest - and still have time to check out Slovakia's capital Bratislava and one of Bavaria's oldest cities, Passau. 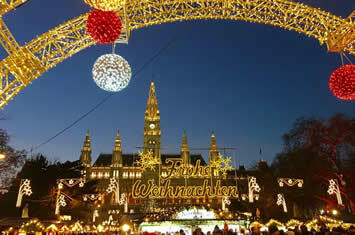 The holidays are pure magic along Europe’s waterways. 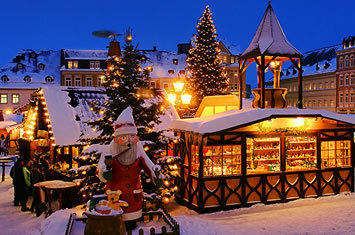 Storybook villages and snow-capped castles line the rivers’ banks, and in grand cities and charming towns alike, festive Christmas markets celebrate the season with colorful crafts, gingerbread and warm, spicy glühwein. 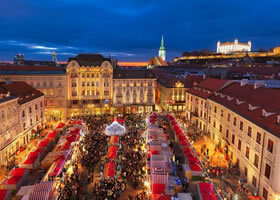 In medieval town squares and down cobbled lanes, aromas of old-world family recipes waft from kitchens—hot potatoes and chestnuts, grilled sausages and baked treats. 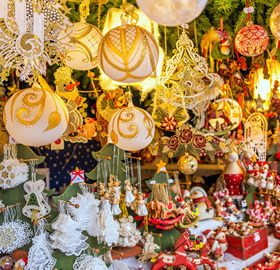 Market stalls offer a delightful array of hand-carved toys, ornaments, nutcrackers and colorful woolen scarves. Viking’s Christmas holiday cruise help spread the cheer with onboard festivities: you can bake gingerbread cookies with our Executive Chef, decorate the ship’s Christmas tree and enjoy live, regional holiday music from a local ensemble. 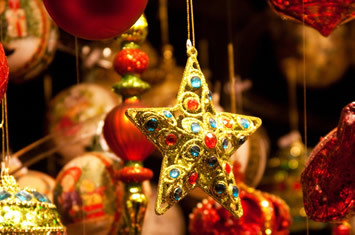 This holiday season, immerse yourself in the Christmas spirit with Viking. We sail out of Passau, Germany on the lovely Viking Longship Ingvi (Ingvi - Norse God of Kingship). Viking Cruises was voted the #1 river cruise line by Condé Nast Traveler in their 2017 Readers' Choice Awards. 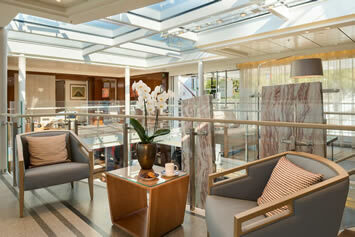 CruiseCritic awards the Ingvi 4 out of 5 stars and says the first thing you notice upon boarding is all the natural sunlight—yes, views from anywhere on board will be great! Cruiseable awards 4.5 out of 5 stars, and past guest reviews average 4.75 out of 5—so you're gonna love this ship! And you can feel good knowing you're on a "green" ship with hybrid diesel-electric engines that burn less fuel and produce 20% fewer emissions. Solar panels on top help fuel the engines and the ship's chef even maintains an organic herb garden up there! Because we spend so much time in port, the focus is more on the destinations, and less on the actual sailing. That's why shore excursions in each port are included in the price of this cruise! There's no gym on board (you'll get your exercise exploring the fabulous cities and towns we'll visit). No theater with huge Broadway-style productions because you'll still be in port checking out the local nightlife instead! That said, you'll still have plenty to appreciate on board. Service is top notch! Meals on board are fantastic (and typically much better than what you expect on ocean cruises). The décor throughout is understated and minimalist. 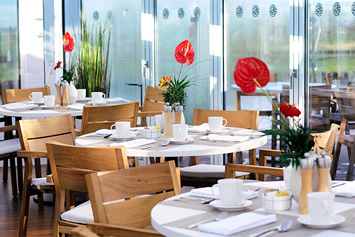 Little touches everywhere will amuse, pamper and amaze you. • Let's Cruise Away Welcome Aboard Cocktail Party (with free cocktails! )—come meet your fellow travelers and friends in a warm, welcoming, and casual atmosphere. Play our fun mingling/get-to-know-you activity, and start forging friendships that will last a lifetime. • Onboard Host/Cruise Director—We'll be there to make sure you have a great vacation. Our colleagues will resolve any issues that may arise, answer questions, and help you enjoy your cruise to the utmost. We'll coordinate and host activities and parties each day—all of which are optional (it's your vacation: pick and choose what you want to be a part of). • Exclusive excursions just for our group (in addition to the free excursions offered by the ship), including at least one service project: in the past we've helped deliver vital home supplies to hurricane victims, and assembled hygiene kits for local LGBTQ homeless. 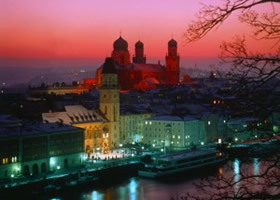 Arrive in Munich, then transfer to your ship in Passau. After boarding, spend free time exploring, or join our “welcome walk” to stretch your legs and get oriented. Then use the rest of the afternoon/evening to wander this ancient German city, famous for its baroque architecture. Perhaps check out the Christmas market here? Overnight on board and then our included excursion in Passau. Passau was settled over 2,000 years ago by the Celts and then became a strategic fortress town for the Romans, primarily financed by nearby salt mines. We'll visit the ancient fortress Veste Oberhaus that overlooks the city, and then on to St. Stephen's Cathedral, which houses the second-largest cathedral organ in the world. Evening time you'll be free to continue exploring, or make your way back to the Christmas market. The third-largest city in Austria, Linz is the birthplace of the Linzer torte, the oldest cake in the world, with a recipe dating from 1653! Today's excursion will allow us to sample the real thing. Then we'll visit the birthplace and house of the famous composer Mozart, and St. Mary's Cathedral (the tallest in Austria), and other architectural wonders from as far back as medieval times. Home of the oldest known grave in Austria (a boy who lived over 27,000 years ago! 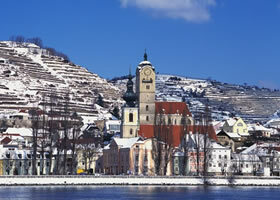 ), Krems is part of the Wachau Valley UNESCO World Heritage Site. Today's tour will include Gottweig Abbey, a Benedictine abbey over 1,000 years old, and Steiner Tor—an original city gate, still standing after 500 years. Ah, Vienna! Where to begin? 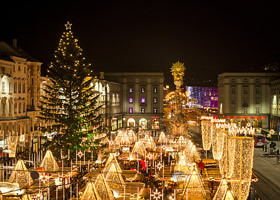 There's the Kunsthistorisches Museum (Museum of Fine Arts), the Schönbrunn Palace (UNESCO World Heritage Site), and over half a dozen major Christmas markets. Also symphony and ballet, a thriving LGBTQ community, historical sites galore, and even legal brothels! Surely there's something for everyone in this thriving European capital of culture. This is the only capital in the world that borders two other countries (Hungary and Austria). Our tour will include a visit to the magnificent Devin Castle, which towers over the city, and a stroll through the old town (medieval, of course!) on our way to Michael's gate. Built in 1300, this original city gate was beautifully reconstructed a few hundred years ago. 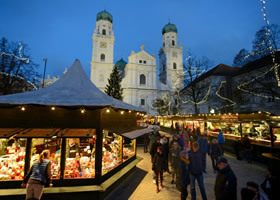 Maybe some more Christmas markets this evening, if you like. Nicknamed "Paris of the East" because of its natural and man-made beauty, Budapest is the cultural and historic capital of central Europe. 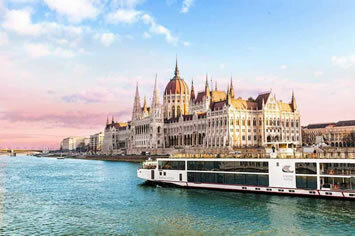 We dock next to the world-famous Parliament Building. 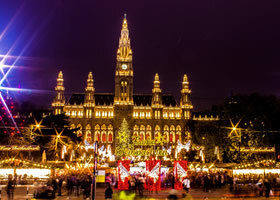 The Christmas markets here are some of the best in the world, as are the art museums, cathedrals, palaces and historical sites. We'll spend the day touring many of these, and then you'll have time to explore further on your own. We remain overnight in Budapest, so you can stay out as late as you like, no problem! Alas, our adventure comes to a close this morning as we disembark and head home...or do you? 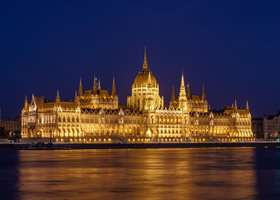 How about a few extra nights in Budapest? There's no way we did and saw everything yesterday! Prices include almost everything: your berth and transportation from port to port including taxes, onboard entertainment and activities, free shore excursions in every port, all your meals and snacks including beer/wine/soft drinks with meals, free WiFi on board, all Daddy Cruise extras, and much more! Taxes & charges of $200 pp, and optional insurance are additional. ROOMMATE Matchup Program let us help you find a suitable roommate. $100 non-refundable matchup fee guarantees a roommate to help you save money. Current rates may be lower or higher than rates as listed above based on current promotions and availability of cabins at the time of booking. An agent will apprise you of any changes, available pricing promotions and cabin options specific to your interests before moving forward with any booking or charging of your credit card. Web Page © Happy Travel, Ltd. Logos and Images © RSVP Productions Inc., Atlantis Events Inc., Daddy Cruise, etc.